The charred section of Highway 21 near Lucky Peak entered into phase one of rehabilitation on Saturday. The human-caused fire, known as the Mile Marker 14 fire, started on July 19, 2016. It burned a total of 4,311 acres. Wildlife and rehabilitation experts say the emergency stabilization effort is important so that animals have food and wind breaks in the winter and vegetation to prevent erosion and protect the watershed. Just like helicopters were used to douse the MM14 with fire retardant, they were again in motion nearly two months later to help with rehabilitation efforts. In the long run, the project will help protect the upper and lower portions of the watershed by reducing the risk of runoff and erosion. "When you remove all the vegetation, the rain comes down really hard, impacts and disturbs the soils and it will take off a lot more soil than if you had the vegetation there," said Cindy Fritz, a rehabilitation specialist with the Bureau of Land Management. 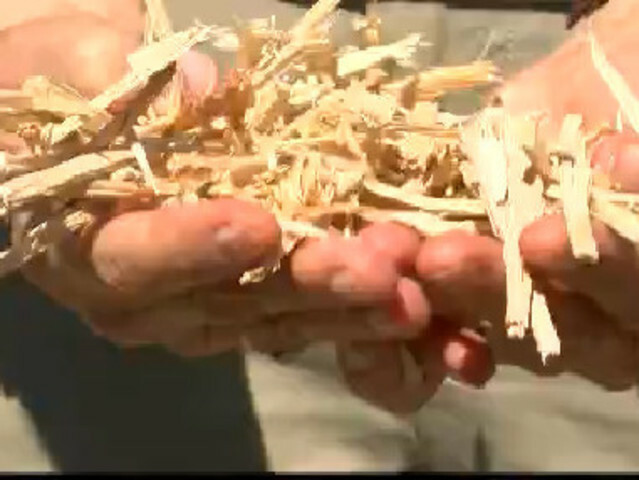 The product they spread onto the soil Saturday looked similar to hay but was actually a texture more similar to wood chips. Since the Wood Straw is heavier, it will be able to not only protect seedlings that have already been planted but prevent water runoff. Those with the BLM are focused on restoring and protecting the higher elevations, while Idaho Department of Fish and Game had crews on the ground. It's expected to take about five years before the area will be best fit to support wildlife. The area that went up in flames was a winter range for Mule Deer and elk. "We have no cover left [in the burned area]," said Krista Muller, a wildlife biologist with Idaho Fish and Game. "All the Sagebrush, all the Bitterbrush got burned. So, when those animals come down this winter they're not going to have anything." To avoid having the landscape overrun with weeds, herbicides will be a part of phase two during the first year of the effort. The following year, heavy seeding and hand planting is in order. That is when volunteers will be needed most. In Fritz's estimation, a full recovery is anticipated to be 30-40 years out. "It's a winter range. It hadn't burned in almost 60 years," Fritz said. "It was one of the last really treasured pieces out here." Right now, Idaho Department of Fish and Game property at both burns, the Tablerock and MM14 fires, are closed to all public entry. This will help land managers in their efforts to protect native plants that still have a chance at recovery and to reduce the spread of noxious weeds.